Home News Casey Waits Nine-Years For Second PGA Tour Success & Now A Third Beckons Within 12 Months. Casey Waits Nine-Years For Second PGA Tour Success & Now A Third Beckons Within 12 Months. 2 months ago by Fatiha Betscher Comments Off on Casey Waits Nine-Years For Second PGA Tour Success & Now A Third Beckons Within 12 Months. It shapening-up as hopefully a classic tale of the ole No. 272 bus! Paul Casey waited some nine-years for a second PGA Tour success when he denied Tiger Woods last March to capture the Valspar Championship at the Innisbrook Resort near Tampa in Florida. 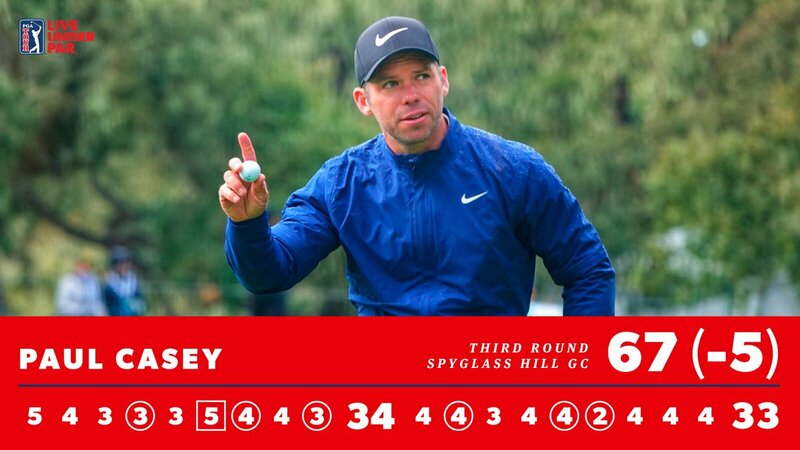 Now less than a year later and the affable Englishman has brilliantly put himself in position to lift a third PGA Tour trophy after posting a third round 67 on the Spyglass Hills course and one of three host venues for this week’s $US 7.6m event. Casey heads into the last leading by three shots at 15-under par from four-time AT & T Pebble Beach winner Phil Mickelson, who let slip his second round lead in posting a day three 70 and with ‘Lefty’ only managing to turn around a horror day with a 13th hole birdie and virtual tap-10 eagle ‘3’ at the par-5 14th. The 41-year old Casey, and playing in the company of his 2018 European Ryder Cup vice-captain, Graeme McDowell, grabbed six birdies and dropped just one shot after earlier rounds of 69 (Pebble Beach) and a blistering day two 64 (Monterey Peninsula). Casey and McDowell had been fortunate on Friday out on Monterey Peninsula as they ended the round in steady rain but just moments before a siren sounded to halt all play and with the threat of more severe weather moving into the Monterey region. No such concern on day three for the World No. 24. “It was great day’s golf and I played very, very well so very happy with my score,” he said. “I am having a blast. I played with Graeme McDowell and his partner and my partner, Don Colleran from FedEx. We teamed up together last year and we had good success last year. We’re chasing Fitzgerald and who was it, Streelman? We’re determined to try and beat them this year. So we’re putting up a good challenge, so, yeah. “And the rain stayed away for most of the day so very happy. “With the course being very soft you have to be very aggressive, you have to manage spin as much as you can. I just saw Phil’s shot out of the bunker at 4 at Pebble. It’s very difficult to get close to some of the back pin locations. “But the guys know these courses well because we play them all the time in the rotation. And, yeah, the courses are doing remarkably well considering somebody threw out a stat that we have had, I don’t know what they, half the rainfall, annual rainfall in a few days or whatever stat was, I don’t know. Of course, it’s not lost on Casey this year’s US Open will return to Pebble Beach and for a first occasion since 2010 and when he enjoyed a three-way share of the opening round lead before eventually finishing T40th behind McDowell. And Casey was quizzed if he learnt anything ahead of returning in June from walking three rounds in the company of McDowell. “Actually very little,” said Casey smiling. “G-Mac and I didn’t really discuss, it got mentioned once within the first three holes, I think, mentioned 2010, when was it? 2010? I think I shot 69 in the first round and was tied for the lead and then I finished middle of the pack or bottom of the pack.